An Irish-American gangster joins the Italian mob to exact vengeance on the man who killed his lover. 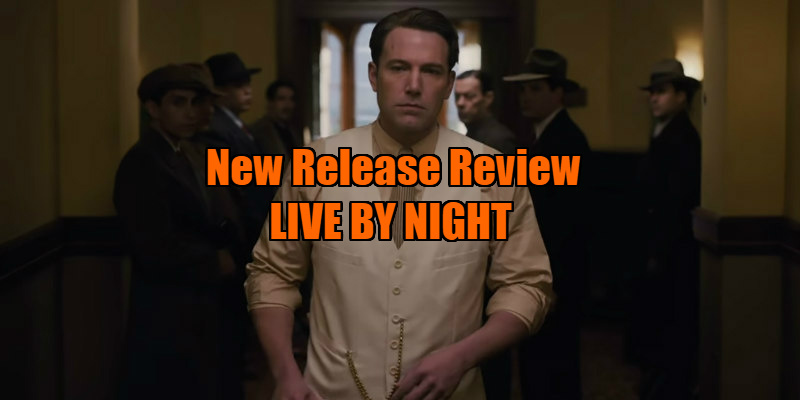 The non-character at the centre of Live by Night is Affleck's Joe Coughlin, an Irish-American Bostonian who returns from World War I scarred by his experience and determined never to take orders again. As such, he becomes a criminal, specialising in knocking off poker games organised by the Irish mob, which in Boston is run by the sinister Arthur White (Robert Glenister). As if this wasn't enough of an affront to White, Coughlin is bumping uglies with his moll, Emma Gould (Sienna Miller). A series of events lead Coughlin to join the Italian mob, who send him to Florida to oversee their plans to corner the lucrative Cuban rum market. He hooks up with his former cohort Dion Bartolo (a chubby Chris Messina essaying one of the film's many crude Guido stereotypes) and the two battle the various factions of the Florida underworld. In terms of its plot, Live by Night offers little we haven't seen before. It's another generic gangster narrative, but that's fine, as the appeal of the mob genre was always its characters and subtexts rather than its rote rise and fall 'crime doesn't pay' storylines. Affleck touches on some interesting themes but packs too many subplots into his narrative to satisfyingly cover any of them in a two hour movie. He pays lip service to the anti-Catholic bigotry that was so rife in early twentieth century America, but ironically all his Irish and Italian characters conform to the criminal stereotypes of the time. Coughlin is a thoroughly despicable character (his treatment of a teenage wannabe starlet played by Elle Fanning is particularly dark), and Affleck seems conflicted as to how he should be portrayed. As if desperate to persuade viewers to sympathise with Coughlin, the KKK are introduced as his adversaries, but they're represented by RD Pruitt, a stereotypical inbred redneck played like a cartoon character by actor Matthew Maher, whose presence makes it impossible to take their threat, or indeed the film, seriously. On the evidence of The Town and Live by Night, Affleck wants to be Irish almost as much as Tarantino wants to be black. He mercifully eschews attempting an accent, but he casts a pair of English actors (Miller and Glenister) in Irish roles, and anyone familiar with the brogues of the Emerald Isle will find their performances laughable. Miller is particularly awful; hers is arguably the worst Irish accent since Richard Gere played an IRA terrorist, and it doesn't help that she tells us her character is from Cork when she's audibly butchering a Dublin accent (for non-Irish readers, this is like adopting a Texan accent for a Canadian character). If casting Irish actors in Irish roles is too much to ask, surely Hollywood can find a dialect coach familiar with how Irish people actually sound? As an Irishman, I sank into my seat every time Affleck's protagonist's name was pronounced as 'Cofflin'. I suspect viewers of Italian extraction will endure a similar experience. There's enough in Live by Night to suggest a worthwhile screen adaptation of Lehane's book is possible, though with so many characters and subplots, it's possibly a story more suited to cable TV or Netflix. But while a 10 part series might allow for an expansion of its many narratives, two hours is more than enough time to deliver a lead character that resembles a human with a beating heart, rather than the waistcoat wearing tailor's dummy at the centre of Affleck's adaptation. The classic gangster movies of the '30s only needed 80 minutes. 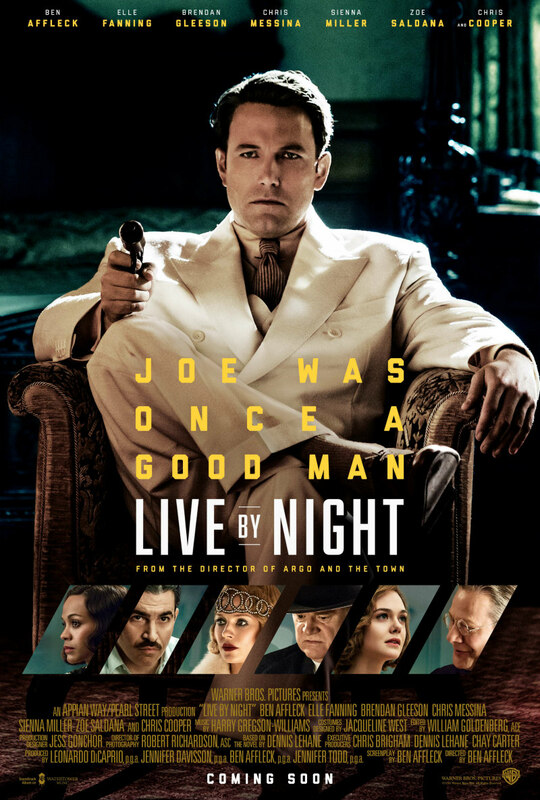 Live by Night is in UK/ROI cinemas January 13th.